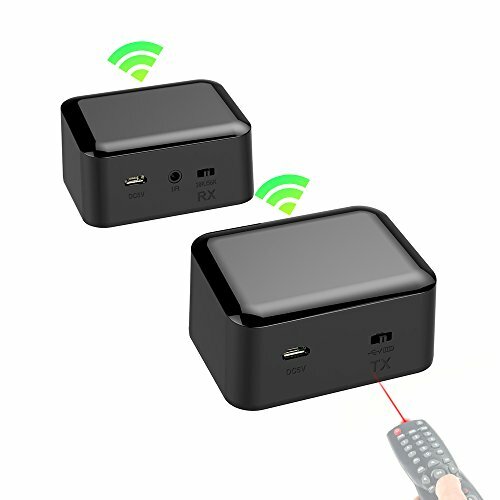 Wireless IR Extender is designed to repeat and carry remote control's signal to where it needs to go. It controls TV Box without line of sight; controls audio and video devices such as AV receiver, DVD Blu-ray player, and satellite receiver set top box STB etc, that are located in another room or inside component cabinet. Avoids an old large antiquated bulky wireless transmitter behind an ultra-thin TV. Our wireless IR extender repeater is easy to install with ultra compact design, small thus easy to hide. This wireless remote control transmitter and receiver system kit allows you to go from room to room and control devices up to 600 feet away through walls, doors, ceilings, floors, etc. with no direct line-of-sight needed. It even works through closet door and closed entertainment system cabinet. Not compatible with components that use RF remotes. Problem about how to use?Please write mail to us,if you have any question,we will help you to resolve it. Compatible with any IR-equipped device,IR signal transmitting≤10m. Remote control is NOT included.Plug and play easy installation and small ultra compact design. If you have any questions about this product by PAKITE, contact us by completing and submitting the form below. If you are looking for a specif part number, please include it with your message.